Taiwan's high-level protest to China against a declaration of new civilian flight paths in the contested strait between them is taking relations to a new low. 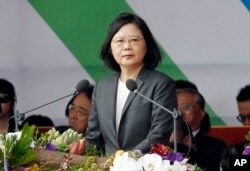 President Tsai Ing-wen in Taipei called a National Security Council meeting Sunday after China opened four routes near Taiwan without notifying her government and began letting civilian aircraft use them the same day, according to a statement by Taiwan’s foreign ministry. Beijing’s move violates the results of talks between air transport associations from both sides in March 2015, the ministry said. Analysts and politicians suspect China knew Taiwan would object and opened the flight paths to continue a two year course of increasing on political pressure on Tsai’s government. The two sides have been separately ruled since the Chinese civil war in the 1940s, when the Nationalists fled China and rebased their government in Taiwan. China insists on eventual unification of the two sides, by use of force if needed. Chinese President Xi Jinping shakes hands with former Taiwan President Ma Ying-jeou during a summit in Singapore, Nov. 7, 2015. 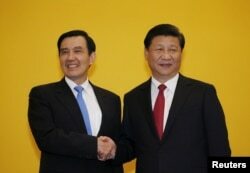 Leaders of political rivals China and Taiwan met on Saturday for the first time in more than 60 years. Public opinion surveys show most Taiwanese oppose unification. Tsai, in office since May 2016, rejects Beijing’s dialogue condition that both sides talk as parts of a single China. Her rejection has irritated Chinese officials. Before the two air transport associations talked in 2015, Taiwan’s then-president Ma Ying-jeou had consented to Beijing’s “one-China” idea for negotiations. The two sides had signed more than 20 other agreements under Ma and lowered overall tensions that had festered for decades. On Jan. 4 China opened its northbound M503 flight route in the Taiwan Strait and three east-west extension routes for civilian aircraft. M503 had received International Civil Aviation Organization approval and should “ease air traffic congestion amid increased flights” between Hong Kong and Shanghai, China’s official Xinhua News Agency reported in 2015. The north-south route “maintains a safe distance from the Taipei region,” Xinhua added at the time. But during talks in 2015, China “repeatedly pledged to use the M503 route only for one-way southbound flights” and to set aside the east-west extensions pending further negotiations, the foreign ministry in Taiwan said. Taiwanese officials are likely to see the start of new flight routes as another milestone in mounting political pressure from China, experts believe. Beijing wants to make Taiwan feel the impact of Tsai’s refusal to talk on the one-China condition, they say. The flight path launches belong to “a whole series of actions taken by China, including military actions,” ruling party lawmaker Lo Chih-cheng said. Over the past two years Beijing has passed an aircraft carrier and military planes around Taiwan, established diplomatic ties with a once prized Taiwan ally, Panama, and asked a list of countries to send Taiwanese citizens to China for fraud trials. Expect “no change” to China’s approach toward Taiwan, Wu said. Tsai said Sunday that Taiwan would increase national security and “communicate fully with the international community” as China’s flight path activations “severely influenced regional security and flight safety,” the ministry statement said. Other counties may be preoccupied with the future of North Korea, Lo said, and China is unlikely to answer any direct pleas from Taiwan. North Korea’s development of missiles and nuclear weaponry has anchored the Asia agenda of U.S. President Donald Trump since he took office a year ago. China still hopes to avoid moves that would anger big swathes of the island’s public, whose sympathy China considers key to its goal of peaceful unification, experts say. Beijing has both a “hard” and “soft hand” in handling Taiwan, said Andy Chang, China studies professor at Tamkang University in Taiwan. The flight paths that China activated Jan. 4 in the 160-kilometer-wide Taiwan Strait do not force Taiwan to change its own aircraft movements, though flights to outlying islands could encounter more traffic from China. China’s north-south path falls within a “flight information region” overseen from Shanghai rather than a military defense zone that would require Taiwan to notify China of its own flights, said Nathan Liu, international affairs professor at Ming Chuan University in Taiwan.